All Meetings of the Flint Genealogical Society are free and open to the public. Anyone is welcome to attend. These are announced in our monthly Newsletter and, at times, through special membership mailings and the local media. See the Events link on our Home page for details on our Next Meeting. Membership Meetings - 7:00PM on the first Tuesday of each month, except July and August. Guest speakers cover a variety of topics. Light refreshments are provided at the close of the formal meeting by the FGS Hospitality Committee. Remember to bring your written questions. Someone has probably had a similar problem and will be glad to assist you. Executive Committee Meetings - 1:00PM on the last Tuesday of each month, except June and July. Subject to change, but usually held at the Perry Archives. See Map below. Queries submitted to the Flint Genealogical Society (FGS) are not posted on-line and cannot be accepted by e-mail. We do, however, publish queries in the Flint Genealogical Quarterly. There is no charge to members or non-members, but they must be submitted by REGULAR POSTAL MAIL only. We do request that they be legibly written (preferably printed or typed), and we request that you limit them to 50 words or less, and include the DATE and PLACE with the ancestor's name whenever possible. Our Quarterly Editor heartily welcomes queries, so don't hesitate to send yours in. If you are interested in having your queries posted online, we suggest you contact the USGenWeb. It is set-up for receiving queries by e-mail and posting them on the Web. We fully support them in this endeavor and see no useful purpose in duplicating their wonderful efforts. 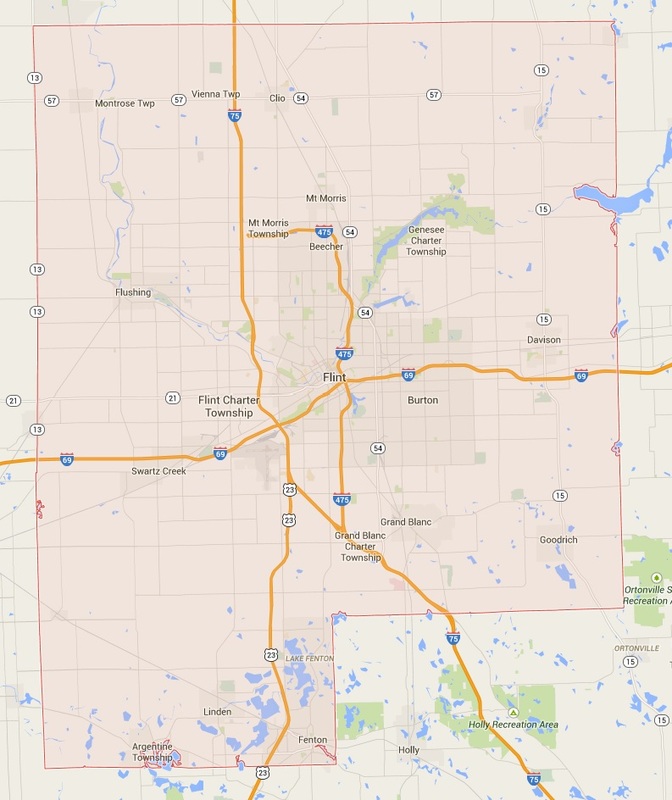 At the USGenWeb county-level, any query will be accepted that pertains to that particular county. "General queries" where the county within a state is unknown, are accepted at the state-level. If you wish to submit an e-mail query, the hyperlinks below will take you to the USGenWeb home page for Genesee County or the State of Michigan. All resources published or acquired by the Flint Genealogical Society (FGS) are freely available locally for public use by any researcher. 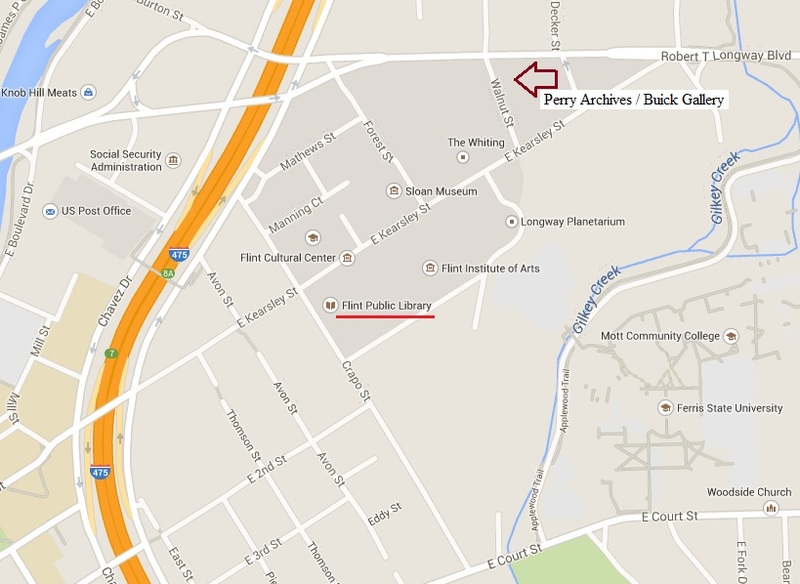 Our acquisitions are donated to and housed at the Flint Public Library for use during normal operating hours. Copies of all FGS Publications are donated to the Flint Public Library and the Genesee County District Library, and are also available for use or purchase (Wednesday's only) at the Perry Archives Building of the Sloan Museum. Excluding Holidays, FGS Volunteers provide free assistance to researchers each Wednesday at the Perry Archives (10am-4pm), each Friday at the Genesee County Clerks Office (9am-4pm) and six days per week at the Flint Public Library (Mon-Thr, 9am to 9pm; Fri-Sat, 9am to 6pm). The Society also accepts limited, initial research requests mainly for those home-bound or living at great distances. Requests may be submitted by email or regular postal mail, but MUST contain the POSTAL ADDRESS of the sender. Such requests are normally limited to one or two names, a husband and wife for instance, that can be looked up in easily accessible records. If sent by regular postal mail, the request must include a SASE (self addressed stamped envelope). In addition, the requester is responsible for copying and postage fees. The requester will be notified, by email or postal mail, of the accumulated charges and these must be paid (US funds only, to "Flint Genealogical Society") before any materials will be sent. Although copying costs vary, they typically run from 10 to 25 cents for xerox copies, 25 cents to $1 for microfilm/microfiche, and $3 for non-certified Court House records (within Michigan legislative limitations). As much as we enjoy genealogy and sharing information, as an all-volunteer organization we cannot afford to do extensive free research or to cover the costs of copying or postage for the many requests received each year. We welcome and encourage donations to our Society. Since FGS is a non-profit organization with IRS 501(3)(c) status, any donations beyond actual costs are tax-deductible and benefit many researchers by allowing us to expand our resource acquisitions. Any research request beyond the initial limit of one or two names, which does not include a SASE (self addressed stamped envelope), or which requires extensive research, can only be referred to local researchers who perform such services for a fee. FGS maintains a list of local researchers who accept paid research requests. While these researchers are members of FGS, they provide this service independently on their own. Although the fees charged will probably vary from one researcher to another, in general they presently charge around $10 per hour plus copying and postage. A current list of researchers will be supplied upon request through email or regular postal mail. Fri & Sat. 9:00am to 6:00pm. 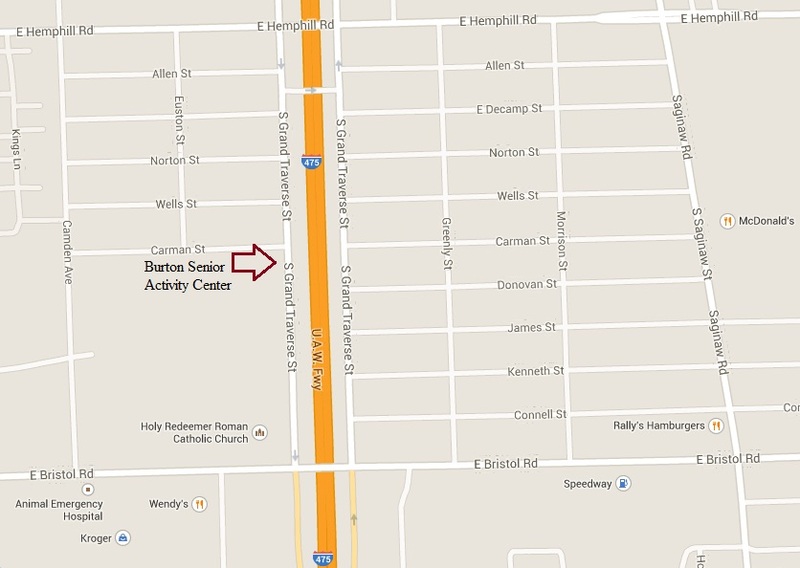 Located at G-4195 West Pasadena Avenue, Flint, Michigan 48504, ph: (810) 732-0110, located just west of Flint. You will find a growing collection of both genealogical materials and local historical information. Located at 900 South Saginaw Street, Flint, Michigan 48502. The office personnel generally refer all genealogical research to the Flint Genealogical Society. The Society provides volunteers to assist seekers on Fridays from 9:30am - 4:00pm on the 2nd floor of the Court House. Marriage records from 1836, and Birth and Death records from 1867 are available, with restrictions on the issuance of birth certificates. Copies of certified and non-certified vital and historical records are available. Research inquiries are welcome. Call: (810) 257-3225 or visit them online at http://www.gc4me.com/departments/county_clerks1/genealogy_research.php. 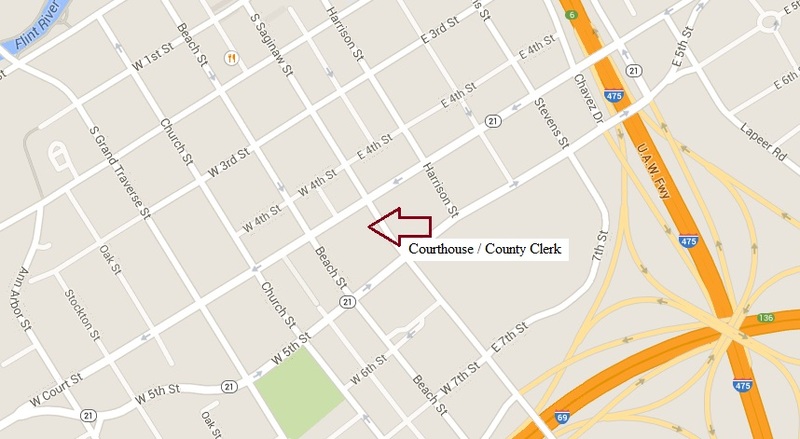 Check ahead of your visit as the Court House is closed on some Fridays due to budget restraints. Where the Flint Genealogical Society meets. Newspaper obituaries of the Genesee County, MI area, starting about 1950, organized alphabetically in approximately 150 three-ring notebooks. Later clippings include 4 and 5 generation photo’s, wedding anniversaries and 80, 90 and 100 year birthday articles. Years 1982-1985 are sparse. All FGS Publications are available for research or purchase (See Publications List for mail orders). Late 1800’s-1970’s Some early directories list spouse, widows, occupation, and children of working age.